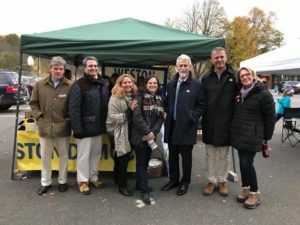 The municipal election of 2017 was a resounding victory for Weston Democrats who won every contested seat they could by a substantial margin. The results varied greatly from the 2015 election when Republicans dominated and took control of a majority of town boards, including the Board of Selectmen. However, the tide has changed. In the first selectman’s race, Democrat Chris Spaulding had a resounding victory over Republican incumbent Nina Daniel. Spaulding got 2,112 votes, more than twice as many as Daniel, who got 908 votes, a 1,204 vote difference. He praised the ground game of the Democrats and how party volunteers walked the town and made hundreds of phone calls in support of the Democratic ticket. Joining Spaulding on the three-member Board of Selectmen will be his running mate Brian Gordon (D) who got 1,781 votes. He beat out Stephan Grozinger (R), who got 1,210 votes. Because Grozinger got more votes than Daniel, he will get the third seat on the Board of Selectmen. Grozinger was conciliatory about the election results. “Congratulations to Chris Spaulding and Brian Gordon on a decisive win tonight. I look forward to working with them both,” he said. 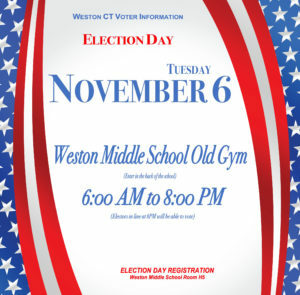 Our mission is to promote democratic principles of inclusion, participation, and fair and open communication for the well-being of all Weston residents. We envision a people-first municipal government of integrity, in which our superior education system and town character are preserved in a fiscally responsible way, while also embracing appropriate initiatives that will rejuvenate Weston. To add your name to our mailing list, please drop us an email. Thank you!